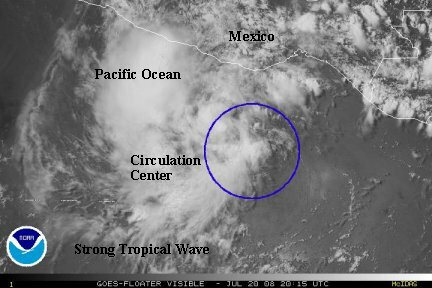 A new tropical wave is showing some organization south of Mexico. The center of circulation is a bit elongated. 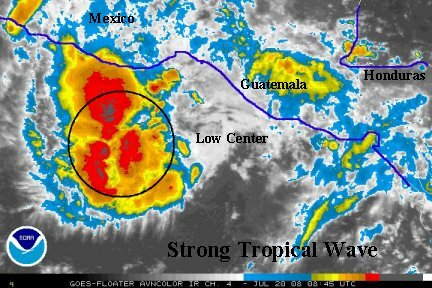 This system has potential for development and should be monitored on the southern Mexican coast for further development. Last edited by Caribbean Traveler on Mon Jul 21, 2008 4:40 pm, edited 3 times in total. The tropical wave is now a depression in our opinion. If convection continues to develop, it could become a storm by later today. It is interesting to note the difference between this "tropical wave" and tropical storm Christobal off of the North Carolina coast. This system looks much more impressive in the sense of real weather issues such as rainfall. The forecast models develop this system and take it close to western and southern Mexico. 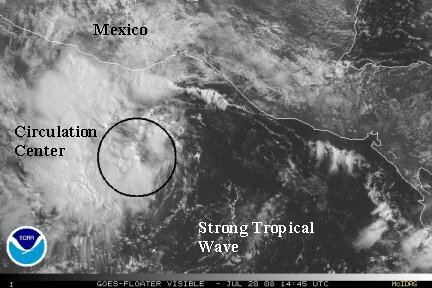 Interests along the Mexican Riviera should follow this low closely. Very heavy rain with flash flooding and mudslides are likely. Last edited by Caribbean Traveler on Mon Jul 21, 2008 1:06 pm, edited 1 time in total. The disturbance south of Mexico still is producing heavy showers and storms, although most is staying offshore. A very definite spin is noted on the satellite imagery, although arc clouds are also noted. This may suggest that the surface low is still somewhat weak. Conditions appear favorable for development. Last edited by Caribbean Traveler on Mon Jul 21, 2008 1:05 pm, edited 1 time in total. Heavy showers and storms continue south of Mexico. The disturbance may be on the edge of the cloud shield. 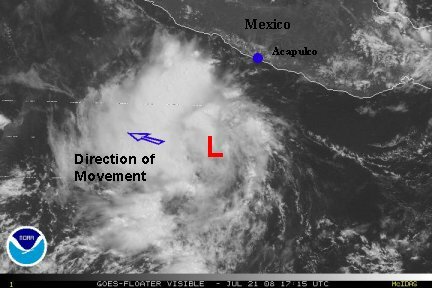 Tropical cyclone development is still likely with this system in the next 1-2 days as it parallels the mexican coast. 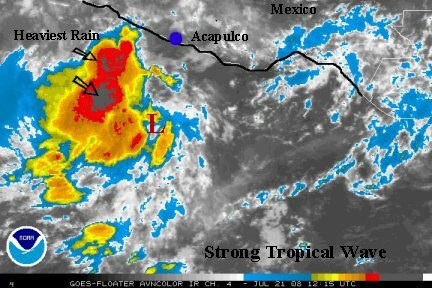 It appears that a low level circulation has now formed about 200 miles south of Acapulco. We think that the distrubance has now reached depression status. The heaviest rain in located northwest of the center, just offshore. Look for the surf and rip currents to be stronger than normal on the Mexican Riviera. The disturbance very slowly will parallel and move away from Mexico over the next several days. Motion is west northwest. NHC has now upgraded to tropical depression 8-E from their last advisory. It looks like this tropical cyclone will not affect Mexico for the expection of higher than normal surf as it continues to develop. 8-E will likely continue to strengthen over the next several days as it moves west-northwest slowly away from Mexico. NHC upgraded 8-E to tropical storm Genevieve with top sustained winds of 40 mph. There is nothing new to report from our update of a few hours ago. The next update will be early Tuesday morning. 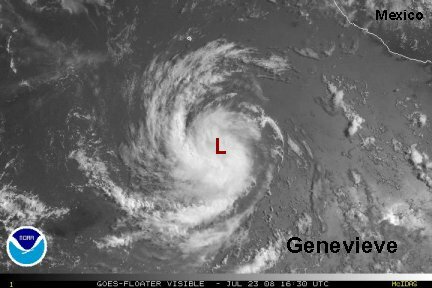 Genevieve continues to slowly strengthen as it moves slowly moves west-northwest. Top sustained winds are probably near 45 mph at this point. Some stronger gusts are possible in squalls. A few thunderstorms with very heavy rain has now developed on the coast. Thunderstorms should gradually decrease in the next 1-2 days as the storm pulls slowly away. Nothing very exciting about Genevieve. It is slowly organizing and we agree with NHC's assessment of top winds near 45 mph. Some gusts are probably higher near the center now. 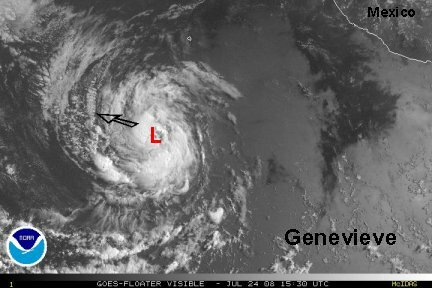 Genevieve is about 460 miles west-southwest of Acapulco. Thunderstorms on the coast have weakened for now, but will likely rebuild with daytime heating. The heavy showers and storms near the core of the circulation remain intact indicating slow strengthening. After today, Genevieve will have minimal impact on western Mexico as it moves gradually west-northwest away from the coast. Genevieve has become much more organized in the last several hours. There has been a burst of deep convection over the center with extremely cold cloud tops. NHC has an estimate of 65 mph for top sustained winds. This estimate looks good to us. 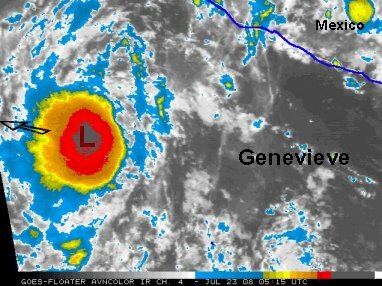 Genevieve continues to move away from Mexico and the only threat will be higher than normal swell. 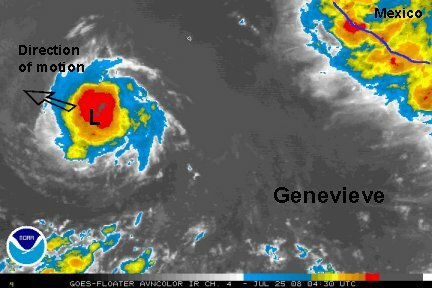 It's possible that Genevieve will reach hurricane status today. 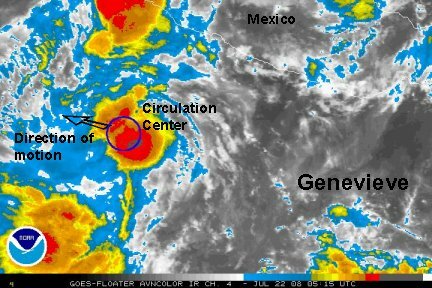 Genevieve is at 65 mph and is moving still farther away from Mexico. Satellite imagery shows a well defined circulation. It will not have any appreciable effect on the resorts. Genevieve is trying to make a comback after looking rather ragged last night. NHC has it as 50 mph which may be close now that is has strengthened some again. 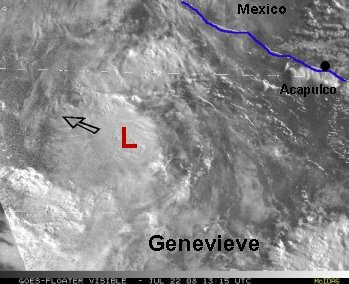 Genevieve poses no threat to Mexico and is over 500 miles southwest of Cabo San Lucas. 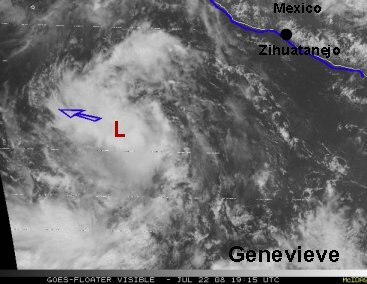 Genevieve is almost 600 miles south-southwest of Cabo San Lucas and heading into the open waters of the Pacific. It is not a threat to land or shipping. Top sustained winds are near 60 mph as convection has been on the increase over the last several hours. Look for some weakening over the next 24 hours as Genevieve heads toward cooler waters. Due to the non-threat to Mexico or shipping, this will be our last update.